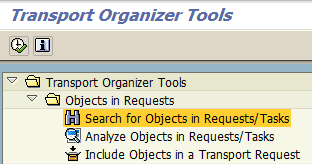 ABAP developers frequently search for objects in transport requests or tasks using SAP Transport Organizer Tool. SAP programmer can search for requests containing specific ABAP program, report, table, view or class, etc using Tranport Organizer Tool as shown in this ABAP tutorial. I sometimes use this tool and search for requests or tasks which contain an ABAP program in order to understan which other ABAP data dictionary objects I've included in the same transport, etc for SAP development deployment health. To find the tranports requests and tasks where an ABAP object is included, first of all an ABAP developer should call SAP transction SE09 Transport Organizer or SE01 Transport Organizer (Extended View) tcode. This selection will display Transport Organizer Tools where a bunch of useful tools which are related with modifying tasks or requests and included objects can be found. On the below search screen according to the type of the object ABAP developers will search for, enter the object name in the textbox and mark the corresponding checkbox for that item. For example, I am searching for an ABAP View object in below screenshot. When you execute the above search screen using F8 or execute report icon, the transport requests or tasks related with the ABAP object are listed in following tables. ABAP programmer can double click on the request or task for details and to see all objects included within that request or task. ABAP programmer can use following parameters in Search for Objects in Requests/Tasks tool. Or simply you can search using "*text_name*" with * wildcards.